To invent life, you must be careless about fate. When you hear the world change, it is a shell placed so close to your ear that the sound becomes part of your mind. Chaos is a gift inherited. Be a pagan among pilgrims so you can harvest the unforeseen. Imagination unrestrained by the ordinary becomes the asylum some of us seek. When we finally listen, we leave home...forever. My grandparents heard something, and trawled across the Atlantic from Ireland to a shore that was concrete and full of noise to start their lives again. Layer upon layer, child upon child, they turned new ground into old territory. Yet two-thirds of the earth is covered in water, and when my parents came of age, they soon were out to sea. As a family we were exiles, cast afloat on my father's ambition to earn more than $10,000 a year and my mother's need to stop researching nature in a biology lab so she could craft some of her own. We were constantly taking possession of new lands. My grandparents, left behind, shook their heads. For them, the shell grew to contain an ancient animal that shut off each chamber it created, trying only to live in the last room of its experience. History repeats itself. Now it is my turn to leave. Two months ago I said, "Enough." After 31 years in the Washington, DC area, I decided to leave the traffic, certain family drain and memories of a dead life for something new, and welcomingly unknown. Renunciation is the true redemption. Made arrangements to give away most of my possessions. Hundreds of pounds of books went to the library. The beloved Bug is now in my sister Kathy's possession. Beds, couches, kitchenware, tables, microwaves -- all given away to good homes. 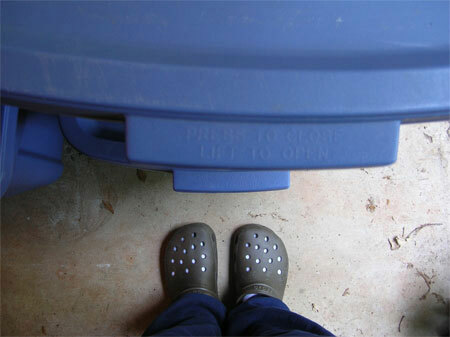 What I still own is housed in blue Rubbermaid tubs -- eight of them, to be exact. Doug came up to VA with his truck, and with a rented UHaul trailer, helped me schlepp these rubber boxes, a guitar, a Black Lab named Walter, some clothes and a laptop to his home in SC. We will venture west to Alaska this summer, then south again to find land and a place to build a round house. Looking through the tubs yesterday, I found I bought only what is important to me. Books, art, music and writing. Am on the right track. What??? You moved? I wondered why your car is parked out front & hasn't moved in 2 weeks. I left a cheese sandwich on the counter for you. It looks different now. You still want it? I could mail it to you. I'll address it to the lady in the round house filled with rectangular blue tubs, south of Alaska. Should get there in no time! Don't worry- they say the green stuff is good for you. You're joking, right? You didn't really move, didja? Oh my gosh, Mary...I am SO PROUD OF YOU! What an exciting adventure...what an amazing way to start your new travels...and new phase of your life. Can't wait to hear all about it. I have a new Wegman's down the street, complete with bakery, kosher market, cafe, sushi bar & hot buffet - and you have a pile of blue boxes? from one who has her "blue boxes" in a small storage room...and darn if she remembers exactly what is in what box!